This story is one in a series of thirteen fairy tales called Contes de la rue Broca, which were first published in 1967. They were quite popular in France, and were later adapted into a cartoon show. 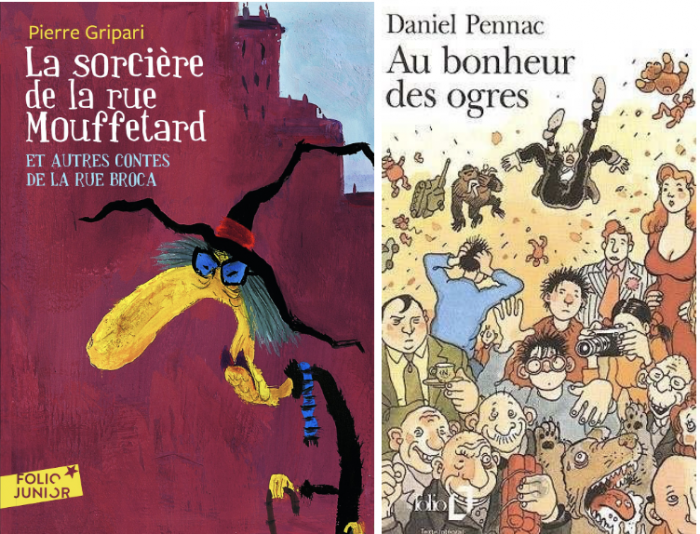 La Sorcière de la rue Mouffetard is about a witch who discovers a method to become young again: she has to eat a little girl with tomato sauce! This book is much like the popular American Fractured Fairy Tales; although the story includes conventional fairy tale tropes, it comically inverts characters’ roles and puts a darker spin on classic children’s stories. 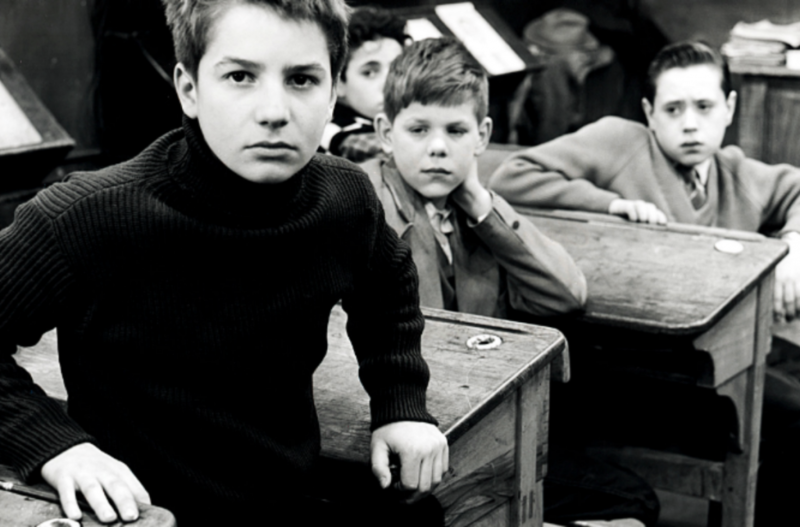 This popular French novel is the perfect entry into Daniel Pennac’s oeuvre. It’s the first in his Saga Malaussène series and tells the story of Benjamin Malaussène, who’s employed as a professional scapegoat. When customers are unhappy at the department store where he works, he takes the blame for the store. Things are going well for Malaussène until someone starts setting off bombs in the store and he is forced to investigate the crimes in order to prove that he isn’t responsible for them. The story’s plot isn’t very important, though–what you’ll appreciate is Pennac’s unique and hilarious voice. Be prepared to look up a lot of slang words! Looking for other funny novels? 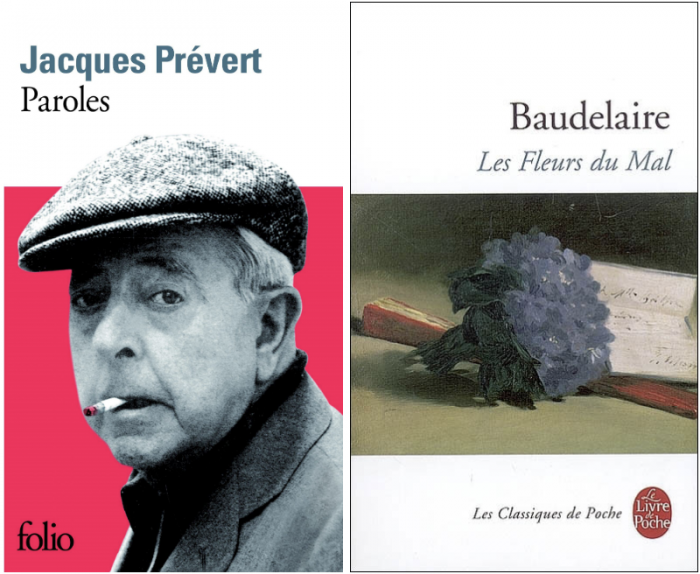 Try Raymond Queneau’s classic Zazie dans le Métro, Georges Perec’s Quel petit vélo à guidon chromé au fond de la cour?, or Claude Sarraute’s C’est pas bientôt fini! René Barjavel is one of France’s most popular science fiction authors, and this unique novel is his best known work. It’s about French explorers in Antarctica who uncover the ruins of a 900,000-years-old civilization, and find a man and woman from the ancient society who have been in suspended animation. They wake up the woman, Éléa, who tells the story of her world. Even if you’re not a huge fan of science fiction, you’ll find yourself hooked by the story if you like romances; Barjavel’s novel is in many ways a retelling of the classic Tristan and Iseult myth. Vingt mille lieues sous les mers (Twenty Thousand Leagues Under the Sea) is considered one of Jules Verne’s greatest novels, along with Around the World in Eighty Days and Journey to the Center of the Earth. You can’t go wrong with any of Verne’s works, but we chose this one since it’s the fifth most-translated book of all time! While this is certainly a difficult novel to read in French, you can always read une version abrégée (abridged classics are great for intermediate readers!). Other unmissable works of French science fiction are Pierre Boulle’s La Planète des singes (did you know a French author created Planet of the Apes? ), Robert Merle’s Malevil, and Stefan Wul’s Niourk. This collection of poems is consistently ranked in the top twenty most-beloved books by French authors. Prevert’s poems have inspired countless other poets and musicians, notably Serge Gainsbourg who pays tribute to Prevert in a few of his songs. It’s a great book for beginning French learners because Prevert’s language is simple and repetitive. Memorizing a few of his short poems is an excellent way to pick up the rhythm of French as well as useful vocabulary words! There’s an entire Wikipedia page called “Les Fleurs du mal in popular culture,” which demonstrates just how influential this collection of poetry has been on authors and artists throughout the world. If you’ve studied French at school, you’ve probably already encountered some of Baudelaire’s poems. Even though they were written during the 19th century, they still feel incredibly relevant, and if you’re going to memorize a poem by one French poet, it should be by Baudelaire. Already familiar with Baudelaire and Prévert’s poetry? 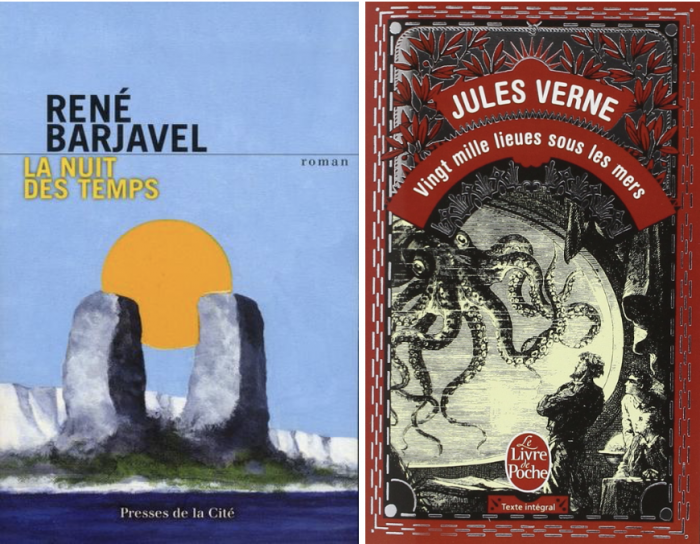 Try the works of Paul Claudel, Stéphane Mallarmé, Arthur Rimbaud, or Paul Verlaine! Intimidated by Proust? We’ve got the perfect solution. Try Stéphane Heuet’s beautifully illustrated adaptation of Swann’s Way, the first volume in Proust’s opus. While certain French literary critics were horrified at the thought of this graphic adaptation (Le Figaro’s critic called it “catastrophic,” “blasphemous,” and “prodigiously inane”), it’s nevertheless a beautiful introduction to Proust and an ideal book for a French learner. 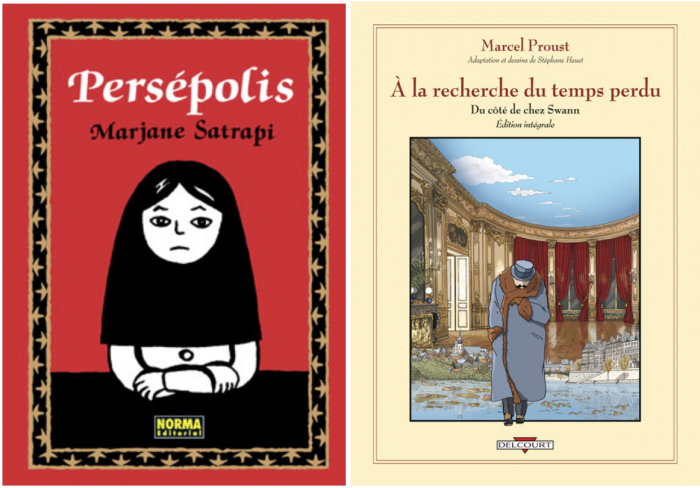 This graphic autobiography by Iranian-born French author Marjane Satrapi was an international bestseller and its film adaptation was nominated for the 2007 Academy Awards. Persepolis depicts Satrapi’s childhood in Iran during the Islamic Revolution, and its sequel portrays her high school years in Austria, as well as her return to Iran where she attends university, marries, and divorces before moving to France. We recommend this book because you’ll not only practice your French while reading it, but also learn about the fascinating intersections of French and Iranian culture. Another wonderful French graphic novel that we highly recommend is L’Arabe du Futur by the comedian Riad Sattouf. Other recommendations: Valérian et Laureline by Pierre Christin and Jean-Claude Mézières, Chroniques de Jérusalem by Guy Delisle, L’Incal by Alexandro Jodorowsky, and Paul à la Campagne by Michel Rabagliati. 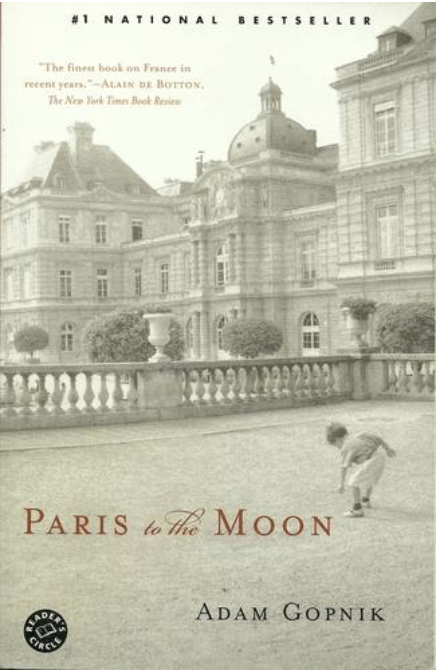 If you’re more interested in reading books about France than books written in French, you have to try Adam Gopnik’s Paris to the Moon! Many books penned by expats about Paris are filled with trite insights, but this books truly brings a new and humorous perspective to the city. Gopnik was the longtime French correspondent for The New Yorker and he’s an absolutely wonderful writer. Lauren Collins, who now lives in France and also writes for The New Yorker, recently wrote another interesting book about the differences between American and French culture: When in French: Love in a Second Language. Ernest Hemingway’s A Moveable Feast and Julia Child’s My Life in France are perhaps the two most classic texts about France. Check out Julie Barlow and Jean-Benoît Nadeau’s Sixty Million Frenchmen Can’t Be Wrong if you’re interested in learning more about France’s history and politics. Finally, you have to read French professor Alex Kaplan’s French Lessons, which depicts her ongoing journey to perfect her French speaking skills.